The Galaxy 170S CO2 Incubator delivers high capacity and efficient to use, with a whooping 170-liter interiors and stacking capabilities. This CO2 incubator from Eppendorf maximizes the interior space by using a fanless design, that also reduces the potential contaminate surface area. The interior is built of a seamless stainless steel that’s easy to clean, and uses 6 sides of radiant heat, to help prevent hotspots and a still environment that won’t disturb powders or delicate samples. Inside this CO2 incubator there is also a 25mm access port for external probes and instrumentation. The New Brunswick Galaxy 170S CO2 Incubator features humidity control, up to 95% at 37°C with a 2.5L capacity reservoir, and a temperature range of between 4°C above ambient to 50 °C. The microprocessor controls of this lab incubator lets users program their desired parameters, and alarms, all from the upfront digital screen. This CO2 incubator can also be connected to a PC for data collection, through the RS-232 connector. Remote alarms can also be incorporated through the supplied alarm contacts. 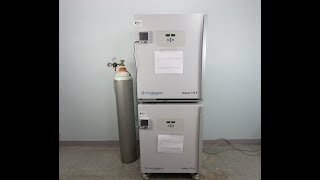 This Galaxy 170S CO2 Incubators have been fully inspected and both come with current temperature validations. All of our lab equipment comes backed with our standard warranty. Should you have any questions, please don't hesitate to contact us.